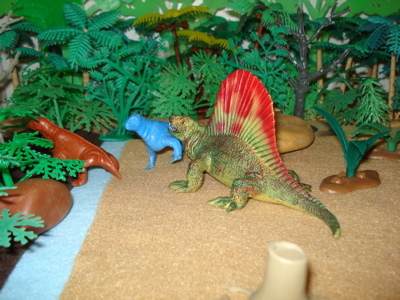 The Bullyland Dimetrodon has a large footprint. 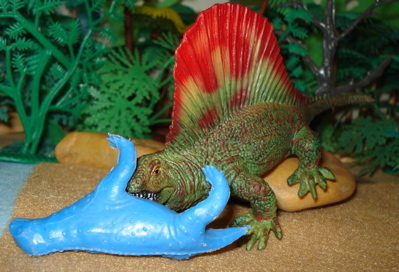 The Bullyland Dimetrodon brings to the Dinosaur toys box a brilliantly colored 1/20 scale figure of the Apex Predator of its time. Its time is now. 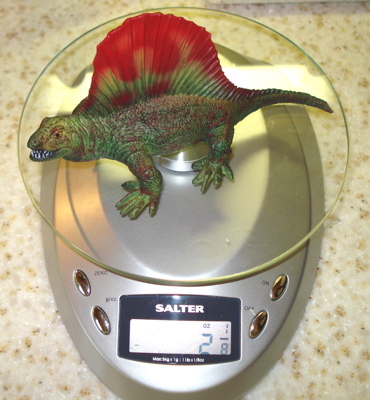 Weighing in at two and one eighth ounces (2.125 oz) and measuring six inches (6") from snout to tail tip and its sail rising 3.25" above the ground this little fella rules today's Permian period, such as it may be. 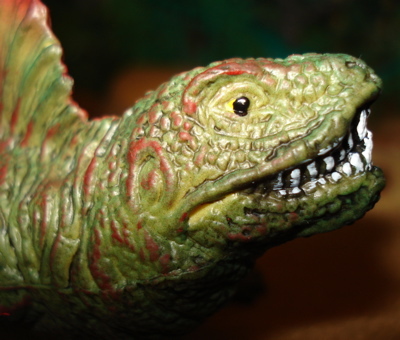 He is very well detailed in a basic green paint job with red highlights and carefully painted eyes and teeth. 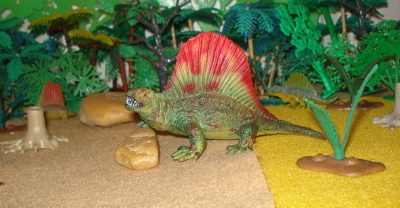 I must say that most of the pictures I have seen of the Dimetrodon have shown it laying about pools of water in large groups, like modern-day crocodiles, waiting for something on the menu to drop by. 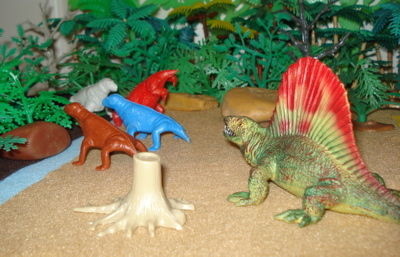 Contemporary thinking, however, is that the Permian Period was a fairly dry, arid time, and the earth was hotter than it is today. 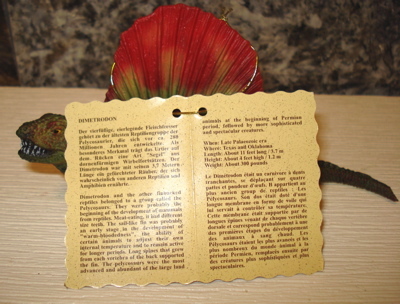 This would imply that water, whether in streams or pools, was at a premium and needed to be jealously guarded. 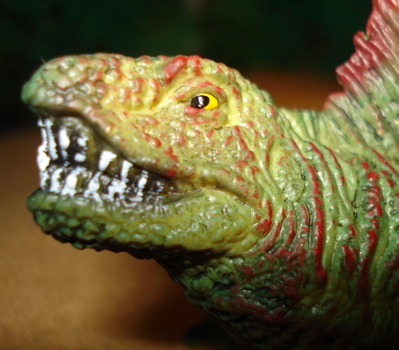 The Bullyland Dimetrodon follows-up on that line of thought. 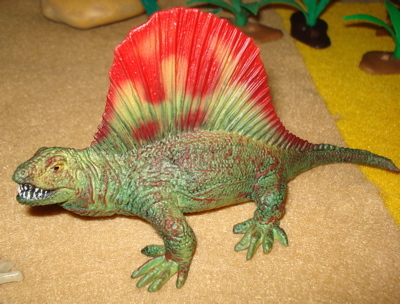 I have found these for sale, they are in current production, for anywhere from ~$6.00 to $18.99 (which is very scary). I'd go for the lower cost one myself. 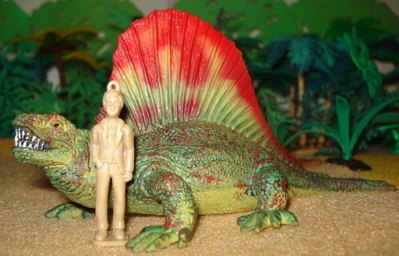 I have also seen photos of this in a monochrome looking tan. Ahhhh, the internet. 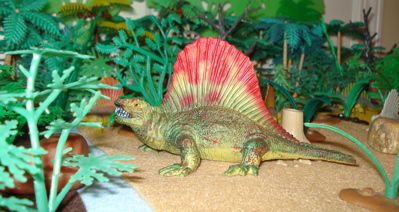 One very interesting aspect to this particular Bullyland Dimetrodon is the size and splay of its feet. 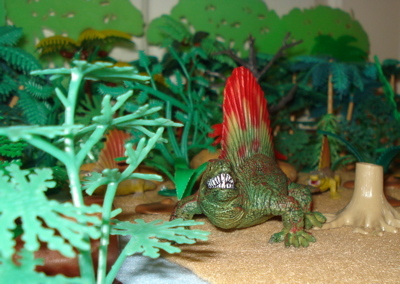 What makes this so interesting is that if, in fact, it lived in an arid, semi-desert environment, it would have required such large feet to walk, run and maneuver on the shifting sands. I don't think that anyone else has come up with this, particular feature. And gets to dine on his menu selection. Owning your own water source means that lunch will often be dropping by on its own. 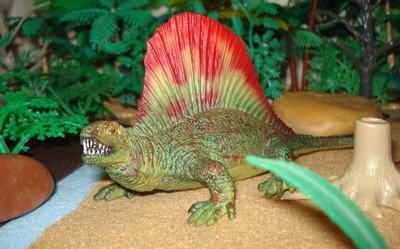 This Bullyland Dimetrodon is what I find to be a relatively unique take on a fairly popular Permian period predator. 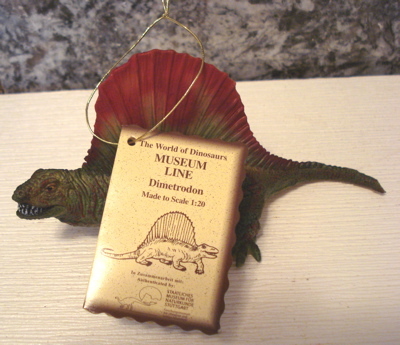 He certainly adds personalty to my Dimetrodon collection. 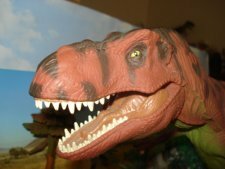 If you are interested in seeing what other companies have to offer in other Dinosaur toys The Dinosaur Toys Collectors Guide home page should prove helpful.